One company that has become a healthy provider of ground systems for Command and Control is Integral Systems (ISI). Since the firms inception, they have been highly focused on space ground systems. In addition, their record has proven their ability to deliver cost-effective, working solutions for satellite operations. Over the years, the emphasis has expanded from bus command and control to payload control, remote station automation, signal monitoring, interference detection, and geolocation. The company has also grown from an initial four engineers in 1982 into a corporation with more than 500 employees. The company headquarters is in Maryland with a growing presence in Colorado, California, and New Hampshire. While satellites continue to become more automated, there always remains the absolutely critical requirement for operator inputanomaly resolution, housekeeping, and maintaining station position. These systems are the only method of providing this access to space borne assets; thus, theyre crucial to maximizing an operators huge financial investment, often in the hundreds of millions of dollars. Space is a complicated domain within which to operate. Space systemsspecifically satellitesare now an integral part of our everyday livesnavigation, communication, weather, and imagery services have significantly improved our lifestyle. People expect precision, responsiveness, and availability from our presence in space. They expect services to be available on-demand, 24-hours a day, 365-days a year (24x7x365). Satellite command and control systems are the essential software and hardware packages that keep satellites operating on a continual basis. Without command and control systems, satellites lose orbit position, systems fail, and services disappear. Command and control systems are the operational nerve center of any space system. The ultimate utility of such a system is derived from the ability of the command and control platform to exploit a satellites capability. As we have previously seen in many programs, added capability to a space system can be realized beyond original planning by improving the capability of the C2 node. Satellite command and control systems have evolved, over the years. They started as dedicated, one-to-one behemoth systems, to mainframes systems controlling multiple satellites within a family, to powerful PC-based systems supporting multiple constellations. The footprint has shrunk as capabilities have increased. Automation has been a key improvement, allowing systems to automatically support routine operations. These same routine operations previously required a large group of operators working manually. Telemetry, Tracking, and Commanding have become much easier in a complex environment. Cost savings and system reliability are benefits resulting from these advances. As technology changes so rapidly, the only way to maintain pace is through an open architecture, one thats extensible and flexible enough to accommodate advancing technologies. Spacecraft lifetimes are so long that requirements on the command and control system evolve over time. As you replace satellites, you typically replace the older ones or refresh the constellation with upgraded technology. Your command and control system must evolve with the technology. Closed systems or point solutions just cant respond fast enough to the advancing technology needs presented by the space industry. The benefit of an open architecture is that such allows the system to keep pace with technology. This reduces costs and risks. You simply cannot solve every situation out of a COTS box. The ability to augment and extend their product lines is a key feature to ISIs large customer base and market leading presence. Examples include unique mission planning requirements and satellite mission data processing. Providing a system with an open architecture lends itself to increasing the capability of the command and control system without major redevelopment of the entire platform. This type of system enables the rapid integration and realization of new capabilities. ISI provides both turnkey systems and individual system components that can be integrated by the customer. Open APIs using standard interfaces, such as Corba, allow for this much-needed flexibility and have been an ISI hallmark. Their EPOCH Integrated Product Suite (IPS) is found to be useful in a wide range of applications. On the commercial front, theres more consolidation, automation, integration, and a move to third-party operations. Legacy systems are migrating onto newer systems that support the consolidated ground segment operations of many spacecraft onto a single system. By taking advantage of the automation provided in the newer systems, substantial operational efficiencies are realized. This has allowed the operations community to shift its emphasis from real-time operations to the planning or pre-operational phase. This takes advantage of the system to automatically execute nominal operations. Theres also the integration of varied systems to provide a single integrated picture of the communications infrastructurebus telemetry and command; payload monitoring and control; and network management. Operators now have an enterprise-level view of their assets. The biggest trend in the government arena is the separation of the ground segment from the space segment as an acquisition strategy. Separating the ground segment procurement from the space segment is integral to achieving the operational efficiencies realized in the commercial arena. This allows the Air Force to procure a ground system designed for the future, not for just a single mission. The commercial industry has been separating ground and space segment procurements for years in order for a single system to operate their entire fleet. CCS-C (Command and Control SystemConsolidated) is an excellent example of this trend in the Air Force, and programs such as GPS OCX are moving in this direction. The design and program objectives of CCS-C, established in 2000 and 2001, anticipated this trend. CCS-C is giving customers the opportunity to change the way they run their operations. If the system design and capabilities limit operations to a staff-centric CONOPS (Continuous Operations)if the system requires extensive care and feedingthe result will be experienced with larger operations and higher sustainment costs. This approach is inefficient, no matter how you cut it. CCS-C is opening the door for more efficient operation implementations. In particular, 3 SOPS has been an innovator in the area of efficient operations. It has been fascinating to watch how satellite operations have changed and continue to evolve. The 3 and 4 SOPS space operators at Schriever AFB are continually deriving new ideas and approaches. From my time performing operations at Schriever using the old mainframe system, its great to see what todays space professionals are managing to accomplish to change satellite operations. Operators will continue to evolve Air Force satellite procedures. The new satellite systems placed into space are becoming increasingly complex. Future space operations will require efficiencies to keep pace with added demands on the operator to manage complex space effects. Automation, consolidation, and integration are the only ways to do more with the same number of operators, while keeping pace with that one constant  change. Additionally, the systems flexible design and openness enables the Air Force to procure a ground system designed for the future, not just for one instance of a mission. The reasons why the commercial industry has separated ground from space segment procurements are to be able to select the ground system that best fits their CONOPS (Continuous Operations) and requirements and to ensure a single standard system to operate their entire fleet. The CCS-C approach took advantage of the EPOCH IPS delivering a standard core capability with the flexibility and extensibility to support numerous and varied missions. The Air Force did a phenomenal job with this procurement effort. CCS-C is and has been on-schedule and on-budget from contract inception. The first initial constellation, DSCS III, completed testing in less than 18 monthsfour days ahead of the contract specified schedule. Since then, Milstar has been transitioned onto the CCS-C baseline, formal declaration of IOC for the system has been reached, and the first WGS vehicle has transitioned full-time onto the baseline. The AEHF (Advanced Extremely High Frequency) development continues on schedule to support the first vehicles 2009 launch. The program has several activities and milestones this year, and CCS-C is in great shape to support each of these events. The CCS-C designs flexibility has resulted in many enhancements. Once the system rolled out to the operational community, there were many requests for additional features and capabilities. This normal evolutionary path has been well supported. Due to a great relationship with the government procurement agency, an energetic and creative team atmosphere has been generated. This helps to maximize schedules and funding. One of the great attributes of CCS-Cs architecture is the ability to upgrade or refresh the system without impacting satellite operations. Change is the one constant. One significant aspect of growth with respect to the operational use of CCS-C has been in the area of automation. Three SOPS has taken the lead in using the automated capabilities inherent within CCS-C through the EPOCH Integrated Product Suite. Certainly, it has evolved with time as operators gained confidence in the new system, but staffing efficiencies are now realized. Such prepares the community for more complex, time-consuming operations. Three SOPS has created and instituted automated state-of-health supports along with other automated features. The WGS satellite is extremely complex and requires a great deal of detail. Once WGS commanding procedures were automated, operations that were more efficient were the result. The onus is on the system rather the operator, and this is a consistent trend within the satellite industry. ISI initiated much preparation and planning to build an executable schedule to support the on orbit delivery of Wideband Global SATCOM transition. This included a significant investment in the development and validation of the entire set of automated on-orbit satellite procedures. An integrated team was created, comprised of the Air Force operational community (3 SOPS), the vehicle manufactures technical experts (Boeing), and the government acquisition team. All needed to work side-by-side to validate the procedures. This approach streamlined and minimized the schedule required to produce fully verified and validated procedures ready for execution against the on orbit satellite. CCS-C is a great success and this certainly is a testament that the separation of ground and space acquisition strategy is working. The partnership with the Air Force and space segment provider is fantastic. Proof, again, that the separation of ground and space segments is highly viable. 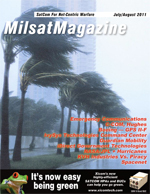 This model can realize continued success for other mission areas as well, not just MILSATCOM. CCS-C is ready to support the critical activities of 2008. The adage, When the satellite is ready; the ground system will be ready, continues to hold true. Satellite data provided by the vehicle manufacturer continues to mature as the program progresses toward launch. The 2008 schedule is full of activities leading toward launch in early 2009.
the Functional Requirements Document for CCS-C was derived from the Standard Satellite Control System (SSCS) Technical Requirements Document. The SSCS document was developed in the mid 1990s with input from many different Air Force satellite program more than just MILSATCOM programs. SSCS was canceled. However, the solid engineering and requirements analysis that were incorporated into the program enabled the government to possess a solid Functional Requirements Document for CCS-C. As a result, CCS-C provides a standard satellite control system core with the extensibility to support many different missions. The CCS-C contract was a huge win for ISI. The project was a challenge, in some ways, to smartly grow the company. In example, the Colorado Springs office grew from two employees in early 2002, to more than one hundred employees at the end of 2007. With CCS-C, RAIDRS (Rapid Attack, Identification, Detection and Reporting System), GPS OCX, and other programs won since 2002, both the ISI Maryland and Colorado offices have grown significantly. Plus, a Los Angeles office has now also opened. In Colorado Springs, 17,000 square feet of office space are being added to the ISI complex. Additionally, RT Logic, an ISI subsidiary purchased in 2002, has also grown and has hired many new employees. RT Logic recently built a new facility on the north side of Colorado Springs. In all, company revenue has doubled over the last five years. The company has worked diligently to hire wisely and acquire talented people. COTS products are the standard method of business. A COTS product baseline allows a large user community to share the maintenance and evolutionary costs of the product baseline. Legacy custom-developed systems were extremely expensive, as the purchasing organization was required to fund the entire life cycle cost of the system. A COTS paradigm allows each user to provide only a small percentage of the overall expense associated with the maintenance and evolution of the product baseline. This has led to a huge life cycle cost reduction for command and control systems. Thats especially important today with budget reductions and stiff competition for weapons systems funding. COTS make too much fiscal sense for any company to travel down any other path! That said, this is true of only legitimate COTS systems. This is not true of toolkit approaches that claim to be COTS simply because they reuse software code. True COTS products save money, reduce risk, and reduce sustainment cost, while allowing for technology refresh throughout a missions life. Not all satellite applications lend themselves to COTS, but there are common attributes across space systems that are perfect for flying a satellite bus in space. For example, it just doesnt make fiscal or engineering sense to continue to reinvent satellite telemetry command and control capabilities. TT&C is easy, but only if you use reliable, proven, and capable systems. COTS products are becoming more popular now than in the past. In the case of CCS-C, this was a COTS product with a proven commercial legacy that allowed for risk mitigation, as compared to development of a brand new system. This saved costs in development, logistics, and sustainment. COTS products offer acquisition agencies the opportunity to rapidly prototype and produce command and control systems that are needed by the military user, as opposed to custom systems specifically built for a single application. And lets not forgetfuture budget constraints will drive government acquisitions to consolidate their space systems on common, COTS-based, command and control systems, for all of the stated reasons. The government will consolidate on systems with proven performance in the satellite ground system industry. Couple life cycle cost benefits with lower development risk, and then mix in the superior performance and capability of products such as ISIs EPOCH IPS product baseline, and there is a winning solution. In 1992, ISI released the EPOCH product line. This was a COTS (Commercial, Off The Shelf) software solution for satellite command and control. The product was ready to go with published APIs accommodating an open, extensible architecture. As a result, the concept and products became extremely successful in the commercial market during the 1990s. Over the years, this approach has allowed the companys customers to focus their precious resources on difficult tasks; the challenge of complex space systems and new payloads. ISI has also provided mission management and payload processing systems to the government. Many people dont realize that all of NOAAs (National Oceanic and Atmospheric Administration) on-orbit satellites are operated today by ISI-provided ground systems. ISI initially delivered the Sensor Processing System and Product Monitor for the GOES I-M (Geostationary Operational Environmental Satellites) ground system. This was followed by the on-time, on-budget delivery of the Polar Ground System in the early 1990s. This, in turn, led to the delivery of the Integrated Polar Acquisition Control System in 1998, supporting BRAC (Base Realignment and Closure) requirements to integrate DMSP (Defense Meteorological Satellite Program) operations into NOAAs operations center at Suitland, MD, and six SOPS (Space Operation Squadrons) at Schriever AFB. Since then, ISI has delivered the GOES N-P system as well as several upgrades to the existing ground systems. The company has since expanded into the Air Force arena with their MILSATCOM Command and Control SystemConsolidated (CCS-C) delivery, proving their capabilities on CCS-C. Today, the 50th Space Wings operators are exploiting the system to do bigger and better things. Delivery of the DSCS (Defense Satellite Communications System) was four days early and ISI transitioned Wideband Global SATCOM onto CCS-C this past January without a hitch. Jeffrey B. Benesh joined Integral Systems, Inc. in 2002 and he is currently the Vice President of the Western Region, Government Division. His responsibilities include Site Operations of the Colorado Springs office as well as Business Development, Marketing, and Strategic Planning oversight for the Government Division. Before joining the company, Mr. Benesh served 20 years in the Air Force. He retired in 2002 as the Program Element Monitor for the Air Force Satellite Control Network and Spacelift Ranges in SAF/USA. From 1998 to 2000, he served as the AFSPC Command Lead for Satellite Control Systems in the Requirements Directorate. While at Schriever AFB, from 1995 to 1998, he served as the Wing Lead for GPS and DSP requirements for the 50th Space Wing and as a 1 SOPS Flight Commander for GPS and DSP operations. He also served from 1990 to 1995 as a Missile Maintenance Officer, and Minuteman III Launch Control Crew, at the 90th Space Wing, F.E. Warren AFB. Mr. Benesh holds a B.S. degree in Mathematics from the University of Nebraska at Omaha and an M.S. in Management from Lesley University, Cambridge, Massachusetts.